If the volume flow difference in two successive measuring periods of max. 210 seconds exceeds the set threshold, leakage alarm is issued for volume flow difference. The patented ALOHA® mechanism allows air pockets to pass through the flow meter without causing false alarms, and without adversely affecting system sensitivity. 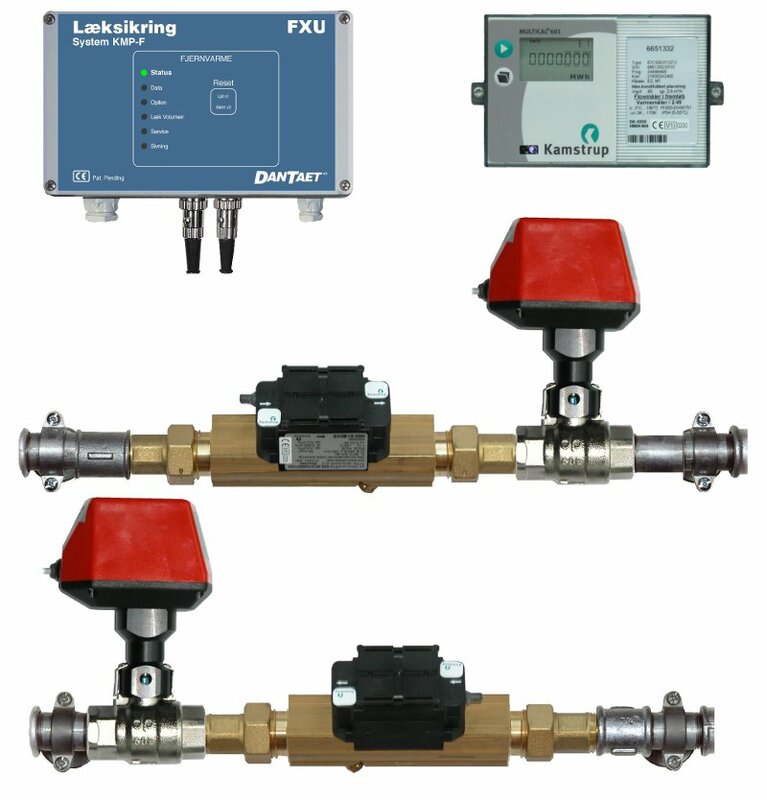 Systems FBU/FXU thus offer optimum reliability. The patented OptiTight® mechanism executes one or more times daily, testing the tightness of the installation by individually controlling the cut-off valves, whereby even minute seepage is detected. If seepage is detected,	alarm is given, and the installation is cut off. Whenever a valve is closed, the system checks its tightness. If a component fails, a System Fault alarm is given. If an internal voltage supply fails, a System Fault alarm is given. Functional errors reported from Kamstrup MULTICAL® cause a System fault alarm. System Faults do not cause installation cut-off. On leakage errors, System FBU/FXU cuts off the installation, gives audible and visible alarm indication and drops the alarm relay. System faults are reported via relay as well as audibly and visibly if possible. Valve errors are indicated visibly. Status, Data, and Alarm indicators, buzzer. Key for alarm mute and acknowledge. Measuring period 210 sec. ; truncated when threshold exceeded; alarm if repeatedly exceeded. Threshold adjustable 0.5-1-2-5%Qp + 1-2-5-10%Qact. Execution: 1, 2, 3 or 4x/day, or by external command. Start at 02:00 + 24 / 2*12 / 3*8 or 4*6 hours. 230V 50Hz L/N/PE via key switch. accommodates one or two liquid sensors type LS-X for protection of sensitive areas with optional cut-off. Sends text message on alarm to one or more mobile phones when connected to FBU/FXU alarm relay. Denmark and a range of countries within and outside the EU.